Superstar Brad Paisley’s new single, “Country Nation,” was delivered to country radio today, and Paisley is bringing the song to TV as well, with three upcoming performances heading into the Labor Day weekend. Before launching his “Country Nation College Tour presented by Zaxby’s” on September 6, Paisley will appear on The Tonight Show Starring Jimmy Fallon, Thursday, September 3 on NBC 11:35pmET; the Today show’s Summer Concert Series, Friday, September 4 on NBC 8:00amET; and will headline ESPN’s College GameDay season opener on Saturday, September 5 at 9:00a ET with a live performance from Ft. Worth’s Sundance Square. 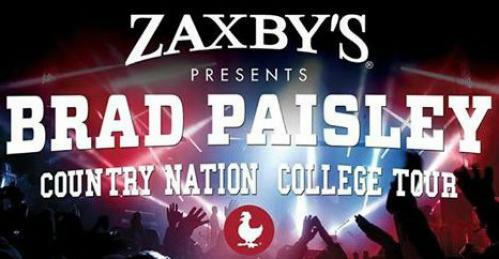 Paisley continues from his GameDay appearance to the first stop on his “Country Nation College Tour presented by Zaxby’s” at the Virginia Tech campus the following day. Breakout artist Eric Paslay will be the special guest. Paisley is taking his show to select IMG College partner universities to provide free entertainment for the campus community. Other upcoming shows include September 10 – The University of Texas with three-time GRAMMY® nominee and Texas native Pat Green as special guest, September 11 - Baylor University with the comedy band The Raging Idiots (which features special guest Bobby Bones and Eddie from iHeartMedia’s nationally syndicated The Bobby Bones Show), and September 12 – University of Arkansas, also with The Raging Idiots as the special guest. Additional university dates will be announced soon. A celebration of the blue-collar spirit and America’s passion for sports, “Country Nation” was co-written by Paisley and longtime collaborators Chris DuBois and Kelley Lovelace and is the latest single from his chart-topping album, Moonshine in the Trunk.